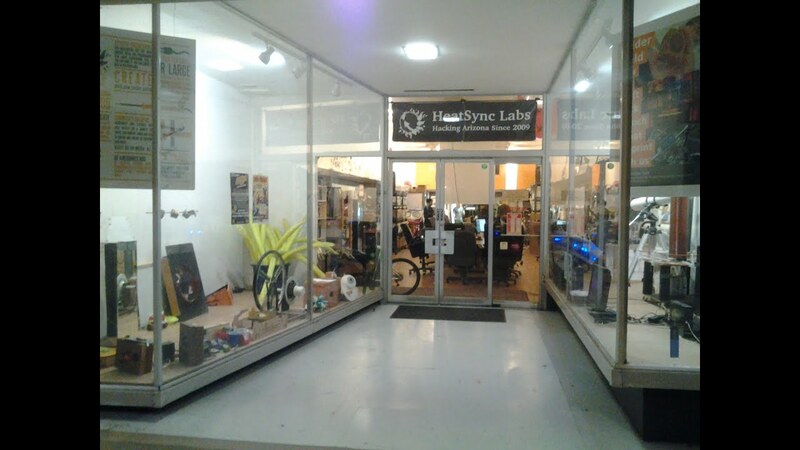 Our local hackerspace is Heatsync Labs which is a member/donation funded nonprofit, based in downtown Mesa, and established in 2009. The lab is filled with power tools, learning events, and helpful people. Its definitely the place to be weekday evenings where it is open to the public to build art and engineering marvels. That said, the display cases could use some more interactivity for people walking by. We decided to start refurbishing this area with an internet of things smorgasbord. The first of our many internet of things implementations to be placed there is a mannequin with a mounted tablet on its head displaying a web page that has a CSS generated face. The face is changeable based on sentiment analysis of speech picked up through a microphone dropped from a drilled inside hole in the roof to an outside one. The process of using software to facilitate all this is fairly simple and involves just two steps. Make a PageNodes flow that takes in speech, assigns a sentiment score, creates a Meshblu connection and publishes useful JSON objects to that server through a websocket connection. #####The PageNodes Portion First we make the voice rec and sentiment analysis nodes. Second we add a MeshBlu server configuration and identify it using the “Create UUID/Token” button. The CSS specifics for all the face components are on my Github. That said, there is a CSS tool that is important to mention here about the animation process of all these face components that happens when changing them per mood: transitions. You place a line like that in a specific CSS class and then write what properities in the class should be affected by the transition utility... in this case 'all'. Then you say how long you want a changing phase to last between class switches or just class property switches, and lastly set what the changing phase should look like. This awesome tool is currently supported on [Chrome](https://www.google.com/chrome/), [Firefox](https://www.mozilla.org/en-US/firefox/new/), and [IE](http://windows.microsoft.com/en-us/internet-explorer/download-ie) among other browsers assuming one uses the most up-to-date of each. The text box is then placed after the face in the HTML and is specialized into only three moods of angry, mellow, and ecstatic unlike the five we have for the whole face: angry, upset, mellow, happy, and ecstatic. Next, in main.js there is a current sentiment value variable that changes from 0 (never lower) to 30 (never higher) based on addition of the integer score given from the sentiment node in our PageNodes flow. An interactive web page that takes in speech from its PageNodes JSON object delivery and changes its face emotion accordingly. Hooking up servos to the mannequin's arms to move them based on the speech input from outside using Johnny-five. Connecting Philips Hue lightbulbs and talking to them through PageNodes to change color based on sentiment as well. Putting in a modestly rare (but not too rare so as to break the bank) Pepe that when my name is spoken replaces whatever current face is showing on the webpage and disappears after five seconds and returns the CSS face back. Make more IoTing happen like saying "dance party" to turn on a strip of a neon color LED arrangement, replaces the CSS face with a disco ball gif, and play a banger from mounted speakers. Have a project we can help make awesome?